​10 Class for Just $99! Must be used within 90 Days. Each of the specials listed above can only be purchased once per person. 5 Class Pass​: $65 Valid for 90 days. Good for any weekly class. Workshops and events not included. ​ Valid for 90 days. 10 Class Pass: $125 Each class is only $12.50 with this pass. Good for any weekly class. Workshops and events not included. Valid for 90 days. 20 Class Pass: $200 Each class is only $10 with this pass. Good for any weekly class. Workshops and events not included. Valid for 90 days. ​Enjoy saving money when you take two or more classes per week.​ Enjoy a 15% discount on all regularly priced merchandise. Receive 10% discount on workshops. Monthly auto-pay on a credit card required. Hey Muskegon, Are you looking for the perfect gift for that special person in your life? 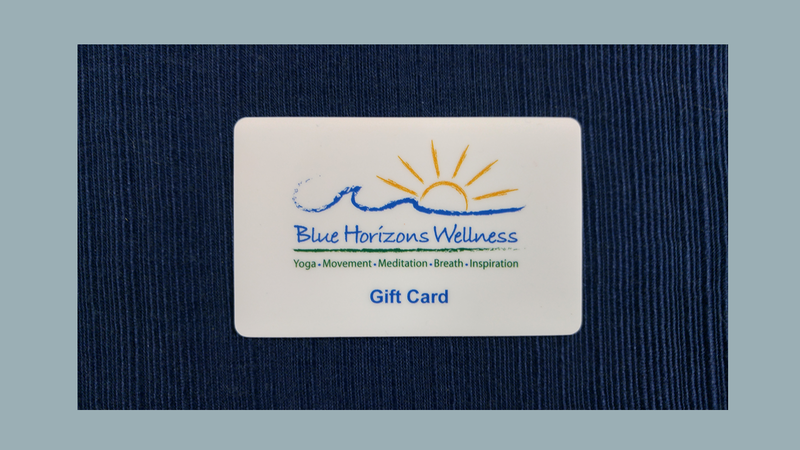 Blue Horizons Wellness gift certificates are perfect for friends and family of all ages - whether they are new to yoga or have been practicing for years. ​Sign up for your classes under the Schedule tab. Yes! Send me inspirational articles! And I would love some coupons from time to time.